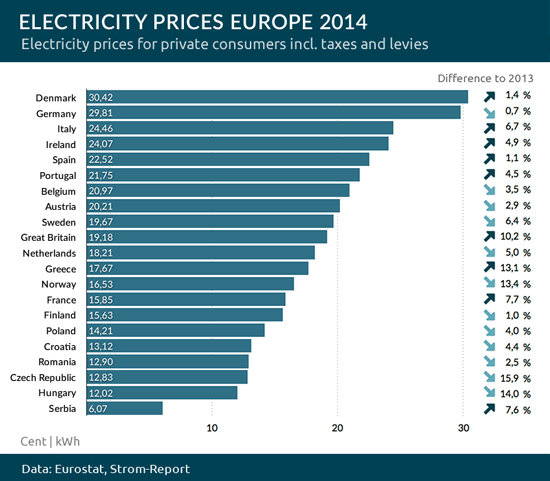 In Europe wind powered Denmark and Germany are vying for top spot on the insane power price ladder. The world over, businesses and households are fast waking up to the fact that the wind industry line about wind power being ‘free’ and getting cheaper all the time is among the greatest lies ever told. Sure, when the wind is blowing the Wind Gods don’t send a bill. However focusing on the cost of what it takes to get them turning, misses the fact that operations and maintenance costs on wind turbines approach $25 per MWh, with that figure increasing over time as gearboxes, generators, blades and bearings wear out or disintegrate. The other, not so minor, cost that the wind industry tends to overlook, is having an equal amount of conventional, synchronous and dispatchable power generating capacity always available to cover those numerous occasions when the Wind Gods determine not to deliver. The owners of conventional generators, like the owners of assets everywhere, are always keen to recover not only the costs of holding that capital, but a profit from doing so. 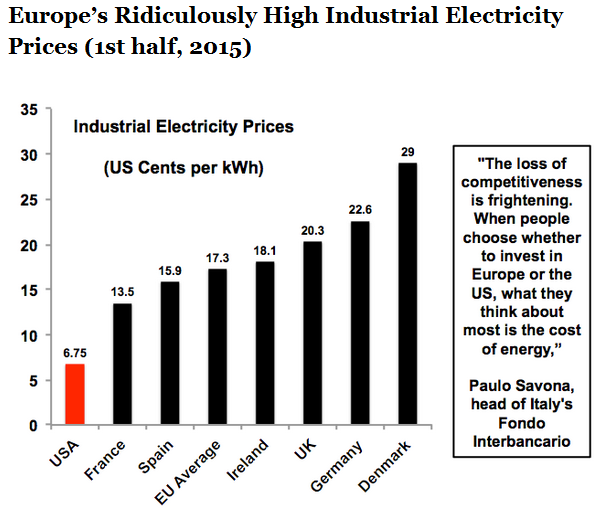 While the wind industry prefers to ignore or simply lie about the total economic cost of wind power, the retail power bills in places like Denmark, Germany and South Australia have a tendency of disclosing the truth. And what a horrifying truth it is. Once ballyhooed as a cheap source of energy (“The sun doesn’t send an electric bill”), Germany’s attempted transition to wind and solar energy is rapidly heading towards a full-blown central planning folly of historic dimensions. 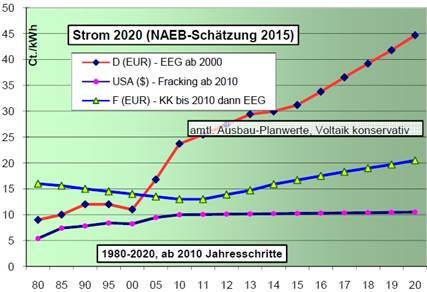 The German electricity consumer advocacy group NAEB projects that Germany’s electric power rates will continue to soar, possibly reaching an industry back-breaking 45 euro cents per kilowatt-hour by 2020, and even higher over the years that follow. NAEB power price projections for 2020. Note that the horizontal scale changes at the year 2010 in order to condense the chart. The upper curve shows German electricity prices in euro-cents per kilowatt-hour, the middle curve shows the price for France and the lower curve for the USA. Source: NAEB. Although the growth in German electricity prices have slowed some since 2015, the gap between German prices and other competing countries is as gaping as ever, with no relief in sight. In fact USA’s prices could even soon begin to ease off. The trend bodes ill for Germany’s energy-intensive sectors such as chemicals, glass and cement. The growing chasm compared to prices in USA and France risks a severe erosion of Germany’s domestic industry and long-term economic growth. I spend a lot of time “debating” the virtues (or otherwise) of wind energy with a bloke on the Australian newspaper blogs who appears very knowledgeable (yet blind to my way of thinking) about wind energy and the electricity grid itself who insists that german wholesale power prices are much lower than ours in 2017…whilst accepting that retail power prices are considerably more expensive (but he insists falling with much more to go) than ours. I suggested that was likely to be govt subsidy to producers or that all the additional costs from useless wind are passed on to consumers to pay. Does anybody have any links to prove the case either way for 2017 not 2015 as discussed in the article above? SA is a great example to use. Who cares what the spot price might be for a few hours? We pay the retail price, as does your antagonist. We are most certainly on the same page. What we are doing to our energy system is I believe the biggest economic and social problem we face, but this article is about German / European power prices and so is my comment. If you don’t know that is fine. Toby, we have published many, many articles on Germany, Denmark and Europe, generally. Among them will be articles dealing with the point you raise, but we would be searching our archive to locate one (we have over 1,600 posts). Try searching in our search bar using ‘German power prices’, say, and we expect you will find what you are looking for. We will too and if we find something we will link it in a reply to you. Labors Catch cry ‘It’s Time’ should now be taken up by our Liberal Federal Government – It’s time to take a hold of the situation and ensure Australia dose not go down the drain of oblivion. It is no longer safe to maintain a RET, and we need to work toward securing energy for the whole Nation whether a State Government wants to accept help or not – the Federal Government is there to look after us all. Weatherill SA’s Labor leader is trying to force the Federal Government to do his wishes, negotiation is not in his sights, he would rather see the State dive further into destruction than show some humility and accept they got it wrong. It’s Time he was removed – but how when SA has a fixed 4 year term – what a disaster that has turned out to be – 4 year terms yes but NEVER fixed – we have a situation now where we cannot get rid of a Government that has shown no capacity to work for its people ensuring security of an ESSENTIAL SERVICE to its people. I can understand that the ignorant might have believed in ‘free’ energy but surely the evidence is now overwhelming that it’s not free or even affordable and it’s not good for the environment either?